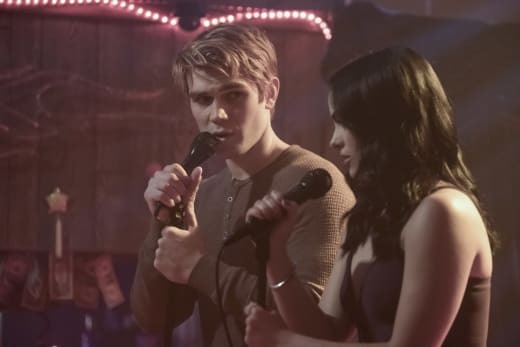 Archie and Veronica dug into the past of The Riverdale Reaper, Cheryl was a bit too protective of Josie, and FP returned to the leadership of the Southside Serpents on Riverdale Season 2 Episode 8. 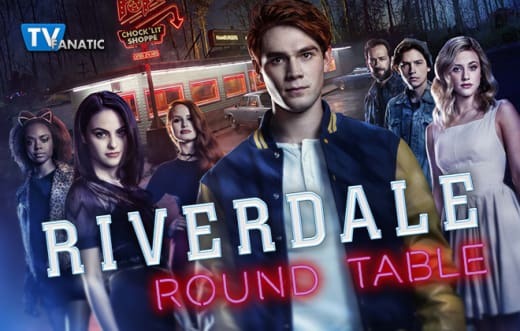 Below, TV Fanatics Jack Ori, Paul Dailly, and Justin Carreiro debate Jughead breaking up with Betty, Alice Cooper channeling her past, and FP placing the blame on his son. 1. The case of 'The Riverdale Reaper' eliminated another suspect of The Black Hood. Do you think this is the last we've heard of this case? Jack: I doubt it. The fact that Mr. Swenson was looking at the photo of his family at the end suggests he's going to do something. I'm not so sure he doesn't know who The Black Hood is or isn't working with The Black Hood, Archie's comment about his eyes notwithstanding. Paul: No way. It seems like the type of case that will grow arms and legs before coming to a close. I don't think we can rule Swenson out at this stage. There's something eerie about him, and I don't think it's down to what happened all those years ago. Justin: This case will no doubt have a twist coming up later on. While the victim side may be explained with Mr. Swenson, I think the killer's side may play a part with the identity of The Black Hood. 2. Alice Cooper brought out her past Serpent persona for the party. React! Jack: Alice making an effort was...interesting. But I want to know more about her comment to FP at Pop's that she didn't want their kids to make the same mistakes they made. I want to know their full backstory! Paul: Yeah, Alice is a real hoot. She's always got another angle when she does something, so I dare say she was more attending the event to look out for Betty than mingling with old friends. Justin: Alice is a complex character, and I think she enjoyed reliving her youthful side of the night. I have the strangest feeling that her past has something to do with FP and Penny Peabody. 3. Veronica was incapable of telling Archie that she loved him. Why do you think this topic drove a wedge in their relationship? Jack: For some reason, all teenage dramas go here, with one person saying it and the other person not being able to. I think Veronica felt like she DOES love Archie and her inability to verbalize it meant she wasn't good enough for him. Paul: I don't know. It seemed random, and like Jack said, all teen dramas go there. It wasn't as tedious as the "Thank You" from The O.C. back in the day, but still, Archie needed reassurance about their relationship, and that's going to cause some serious problems for them. Justin: This was completely overblown. Veronica acted strangely and wasn't like herself; she always seemed like a more mature character who could handle this type of drama. Because she couldn't handle talking about it, it affected their relationship harshly. 4. Betty did the serpent dance to join the Serpents and watch over Jughead. Was this a caring move or did she go too far? Jack: I think she went too far. 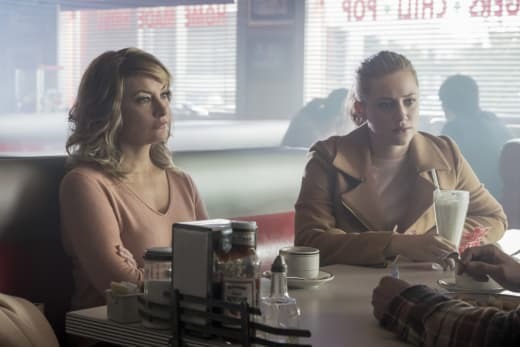 Just like Jughead thought his involvement with Penny was going to be a one-time thing, there's no way Betty can join the Serpents and not get sucked in deeper. Paul: She went too far. I get the need for her to feel like she's taking the whole Serpent thing seriously, but it was a little too out of character for her to swing around a pole to get her entrance into the team. Justin: Betty definitely went too far. 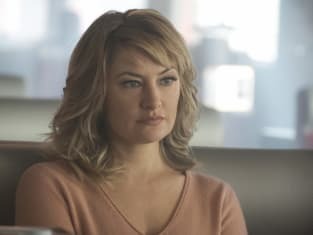 Obviously, she cares about Jughead, but this was a stretch for her character to not only swing on a pole but also to join the Southside Serpents. She was desperate at that moment. 5. FP returned to the Southside Serpents and placed the blame on Jughead. Should he have held this against his son? Jack: I didn't get the sense he held it against Jughead as much as he had decided this was the best way to protect him. 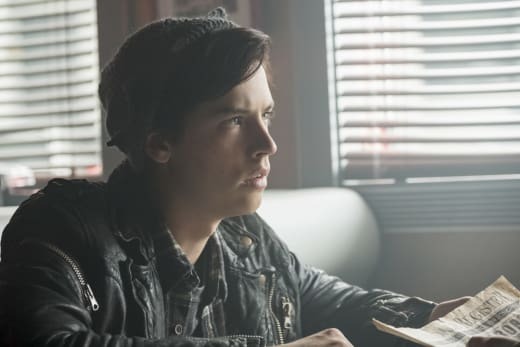 He really does want to give Jughead a better life than he had, and there are no easy answers here. Paul: I don't think he holds it against Jughead. I think he needed to be cutthroat in his approach so there would be no pushback from Jughead. Justin: I think he does hold this against Jughead. For once he saw the possibility of being free, and because of Jughead's mistake, FP had to go back into the fold. However, I don't think he should have held this decision against his son. 6. 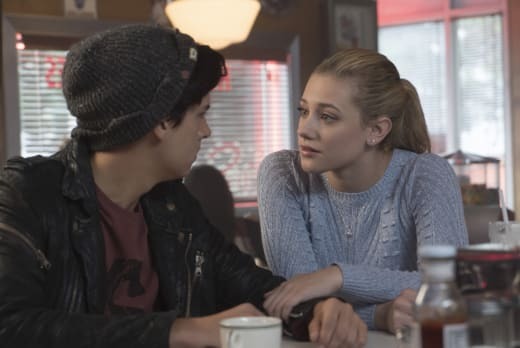 Jughead and Betty broke up because he didn't want to drag her down. Was he right in his thinking or is this just another short break for them? Jack: Ugh. I felt like the breakups this week were contrived just so Archie and Betty can have a chance at being each other's rebounds. Anyway, while Jughead is right that Betty is gonna get sucked deeper and deeper into the Serpents, he was wrong to push her away. He can't protect her by doing that. It's just an extension of his general feeling that he's not good enough for her. I hope they get back together soon and stay together this time. Paul: Meh. Can we have a teen drama that does not give couples random breakups? I'm tired of the back and forth already, and it's really starting to affect my enjoyment of the show. They will be back together in a jiffy. Justin: I agree with the others that I'm tired of seeing this on-again-off-again drama. If they're not meant to be, let's keep them apart and work on their friendships. I don't want to waste time watching these couples make up and breakup again and again. 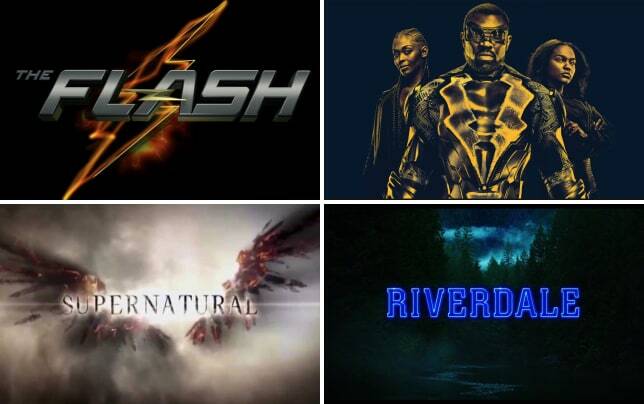 The CW Cheat Sheet: What Will Be Renewed?